Posh Haus will offer its guests an unparalleled level of luxury and a unique shopping experience. 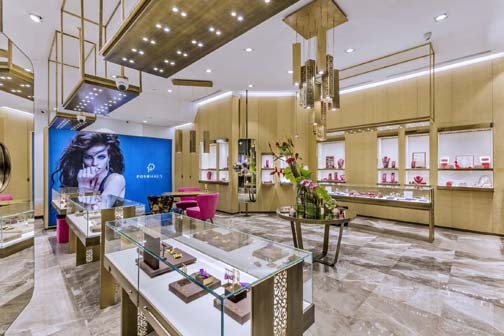 With an initial investment of more than $500,000, Posh Haus is the new fine jewelry and design house that joins the ever-growing list of tenants that have already opened their doors in the commercial area of Paseo Caribe in San Juan. “Posh Haus evokes all the fine things in life. We’re going to offer high-end jewelery pieces — extremely elegant — so this is the house of “Posh” or Posh Haus,” said Nazli Iqbal, co-owner of the new 900 square-foot establishment in Paseo Caribe. “Each collection has been carefully selected to reflect a high level of design, craftsmanship in production and quality of precious stones in each piece. We have design pieces in gold, diamonds, sapphires, rubies and pearls. All the best, the finest and exclusive,” she said. Posh Haus is the result of the partnership between two entrepreneurs: Iqbal and Alex Akram. The new store was completely designed in Milan, Italy, by co-owner Alex Akram and Italian designer Giuseppe Cubuzio. For partners Iqbal and Akram, Paseo Caribe represents the ideal place to locate this new jewelry and design house in Puerto Rico. “Paseo Caribe is beautiful, centric. It is currently the most important real estate project and the perfect commercial site to launch our luxury store,” said Iqbal, who also noted this will be the first Posh Haus store on the island, but there are plans to expand the brand both locally and internationally. Posh Haus will offer its guests an unparalleled level of luxury and a unique shopping experience, she said. The new store is generating five new jobs. According to the owners, the customer can call and request a personal appointment and a driver will pick them up and drive them directly to the store in a luxury car on the day of their appointment. The pieces that Posh Haus will offer are exclusive, in very limited quantities, and that are not usually available in the Caribbean, the store owners said. Posh Haus joins a list of high-end tenants that have set up shop at the mixed-use Paseo Caribe Complex, including, Boho Nation, It Girl, Vom Fass, David Antonio, and Miriam Budet, as well as several restaurants, including Fogo de Chao, Rosa Mexicano, Blue Martini and El Mercado. Hey Buddy!, I found this information for you: "Fine jewelry retailer Posh Haus opens in Paseo Caribe". Here is the website link: https://newsismybusiness.com/jewelry-retailer-caribe/. Thank you.